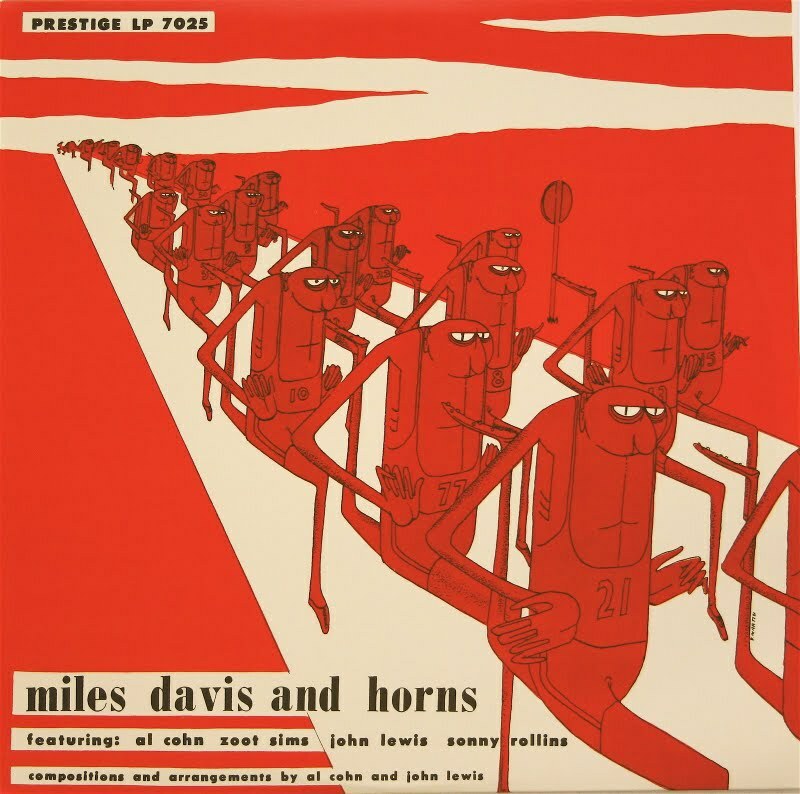 Miles Davis and Horns, a disc released in 1956, culled from a pair of sessions in the early ’50s, and featuring the first recorded collaboration between Miles and Sonny Rollins. Which is interesting, but not quite as much so as the album cover, a truly bizarre (especially for its era, especially for the music it presents) illustration, in a shocking color scheme, that takes several viewings before you really figure out what you’re looking at. Then, once you get your head around the image (legs! ), you get to have it exploded again when someone informs you that the cover was drawn by cartoonist Don Martin, a decade before he made his mark with Mad magazine. While Martin’s distinctive “hinged” bodies were already fully formed at this point (a great touch, to me: all the runners’ wrists hinge vertically, except for #21 in the front, whose hands splay out to his sides), he apparently left the sound effects up to Miles and company, since there’s nary a FOINSAPP, POIT, SIZAFITZ or GISHGLORK to be seen (or heard) on this album. Pity, though I still consider this be a (silent) masterpiece of modern graphic design.